Be honest. 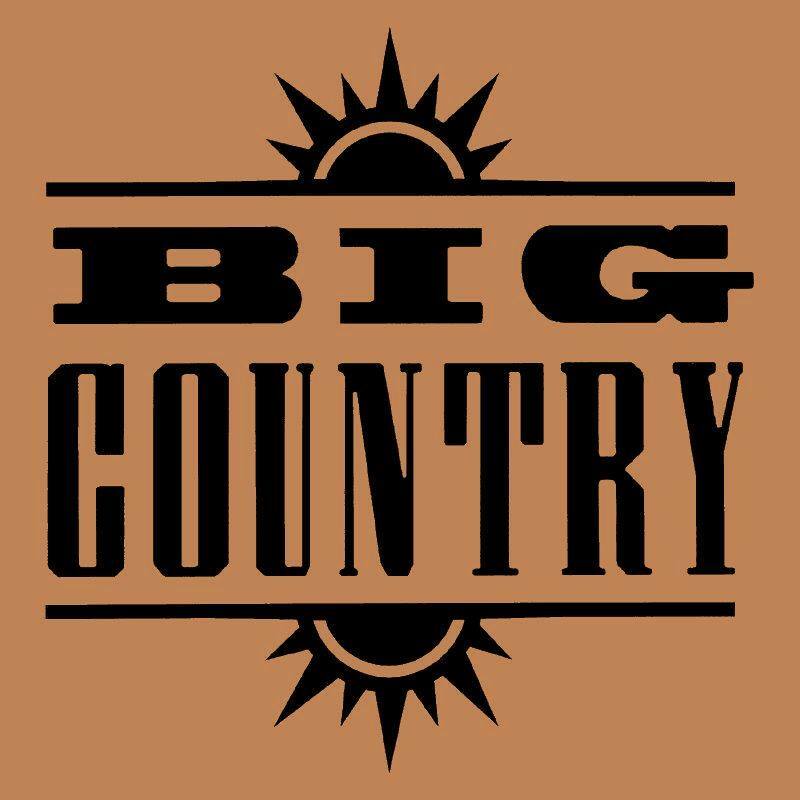 What do you think of if someone mentions Big Country? The band that is, not the 1958 Gregory Peck and Jean Simmons film success based on Donald Hamilton’s novel, with that fantastically-evocative and stirring musical score. Do you think 1980s’ stadium rock, gingham shirts and a strong Scottish identity? Well, surviving member Bruce Watson can put us right on a bit of that, and it’s worth noting that while they made four albums in the ’80s, they made another four in the decade that followed. What’s more, since the tragic passing of original front-man and former Skids guitarist Stuart Adamson in late 2001, they’ve been playing regularly these last four years and released a ninth studio album. Perhaps most startlingly, it’s the Scottish identity bit that Bruce takes me to task on, albeit in a friendly manner. You see, Bruce – while he had moved to Fife by his third birthday – was born in Ontario, Canada. Furthermore, of the original quartet, drummer and fellow stalwart Mark Brzezicki was born in Berkshire, Stuart was from Manchester, and bassist Tony Butler from London. So if nothing else, I might have provided you with some good ammunition for a future pub quiz there. As Bruce puts it, “We didn’t just see ourselves as a Scottish band, and none of us were born there anyway. We were just a band. Bruce moved to Dunfermline in 1963, leaving on the Queen Mary the same day John F. Kennedy was shot. Seeing as his band had a reputation for evoking the spirit of bagpipes, fiddles and other traditional Caledonian instruments though, I asked if he grew up with Scottish folk music. As it turns out, Bruce only started playing guitar when he was around 14, and it took a while to come together. “I wanted to be a football player, but when I discovered I was no good I wanted to learn guitar after seeing films like Tommy, Stardust and all that. That was the iconic scene that bridged the gap between 1973’s That’ll Be the Day and 1974’s Stardust, but did the reality turn out more like the more gritty 1975 Slade film Flame? Was it always inevitable from there that playing guitar would lead to something? Stuart Adamson was three years older than Bruce, and saw success first with Richard Jobson in new wave outfit Skids, another Dunfermline-based band. Was there a healthy scene in Dunfermline back then? “Dunfermline was a hot bed for music! In the street I lived, next door was Manny Charlton from Nazareth, and next street down was Skids drummer Mike Baillie. “You had two options for work. You worked down the pit or down the dockyard. I worked in the dockyard and there must have been 10 bands that came out of there. Did that job sharpen your resolve to get away? 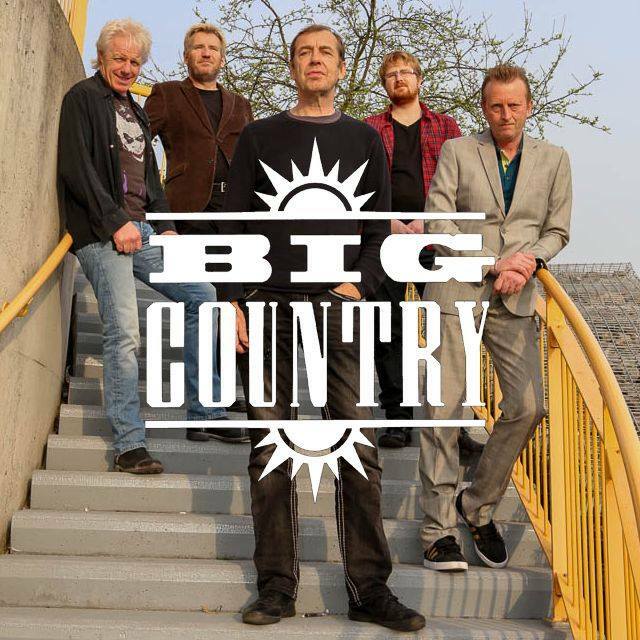 Thankfully, Bruce soon carved out his own career, and fast forward to 2014, Big Country are back, touring with their latest line-up, celebrating the 30th anniversary of their second album, Steeltown, playing it in its entirety each night. Does it seem like it’s been 30 years since Steeltown? “No, it doesn’t. Funnily enough, we did a gig last night, playing Steeltown for the first time since, a free warm-up show at Keystreet, Clitheroe, a music bar where we’d rehearsed the past couple of days. Hang on, did he say Clitheroe? Yes, the band may be forever identified with Scotland the Brave, but their current base is in Lancashire. So, just a few weeks after the ‘no’ vote tipped the Scottish referendum, Big Country are based in an area which remains at the geographical heart of the United Kingdom. Of course, it helps that the band’s manager, Pete Barton, lives in the town, and with band members in London and north of the border, it’s proved a perfect base. Steeltown marked a happy time for the band, coming after the success of debut album The Crossing and their third top-10 hit, Wonderland. The title track was written about Corby, the Northamptonshire town which attracted a significant influx of Scottish workers when its steelworks opened in the mid-1930s, but was facing major unemployment issues by the early ‘80s. 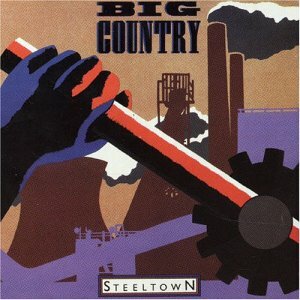 Steeltown proved to be Big Country’s sole No.1, and spawned three more top-30 singles, and was – like their debut LP – produced by Steve Lillywhite. “It was very strange, because Steve was working with so many bands at the time, and took a year out for tax purposes. So we went to Stockholm to record at Abba’s Polar Studios. “That was absolutely amazing, and we got to see Benny and Bjorn, who were there planning their musical, Chess. Apart from alphabetically, I don’t suppose too many people would have put Abba and Big Country too close to each other. The album went straight to the top of the charts, and it seemed like Big Country were at the top of their game. 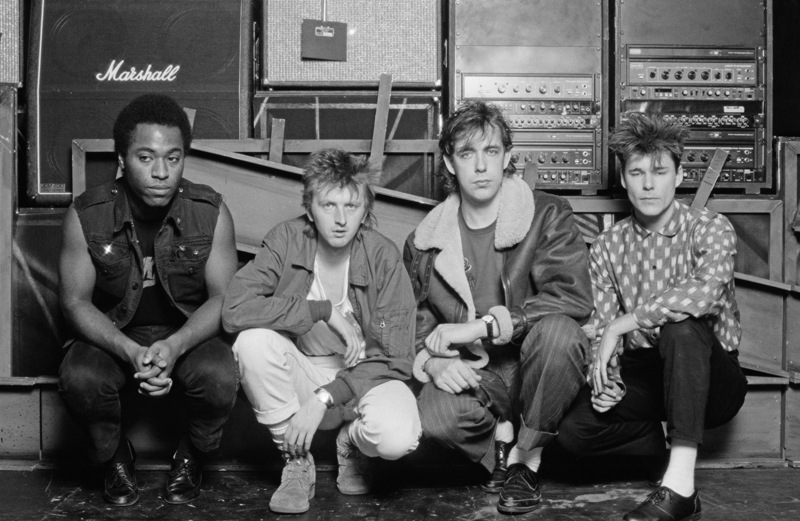 They even played a part in the original Band Aid project, soon after the album came out, although a busy European touring schedule limited them to recording a message for the b-side. Has Bruce a favourite Big Country recording after all these years? “I’m still drawn towards the Wonderland 12”, which came after The Crossing and before Steeltown. That kind of worked. You’ve quite a long tour up to Christmas. I’m guessing you still get a buzz out of playing live. By the late ‘90s, the album sales were suffering and Stuart was suffering with alcoholism and depression. The band had a Final Fling farewell tour in 2000, but remained adamant they would return. As it turned out, they played later that year in Kuala Lumpur, but Stuart’s problems continued and in December 2001 he was found dead in a hotel room in Hawaii. Was there ever a sense of foreboding about what was to happen? “Not really. The band used to break up every year or so. Like any band, where you’ve had enough and just want to take a break from it. Were you still in touch with Stuart at the end? I guess that devastating loss must have made you re-evaluate just what was important. The current Big Country line-up consists of Bruce (guitar/vocals) and his 25-year-old son Jamie Watson (guitar), founder member Mark Brzezicki on drums, former Simple Minds and Propaganda bass player Derek Forbes, and vocalist Simon Hough. Is it nice to be playing with your lad? “It’s great, and Jimmy’s been in the band since we started back up in 2007, initially when I got a call from Richard Jobson putting the Skids back together. “U2 and Green Day got to together to record The Saints Are Coming. I think that was the catalyst for Richard to call me. Did Jamie grow up hearing a lot of his dad’s band? Does he play like you? Can his old man still embarrass him on the road? On the band’s last tour, The Alarm’s front-man Mike Peters was the lead singer. Is it a little different with Simon Hough now? 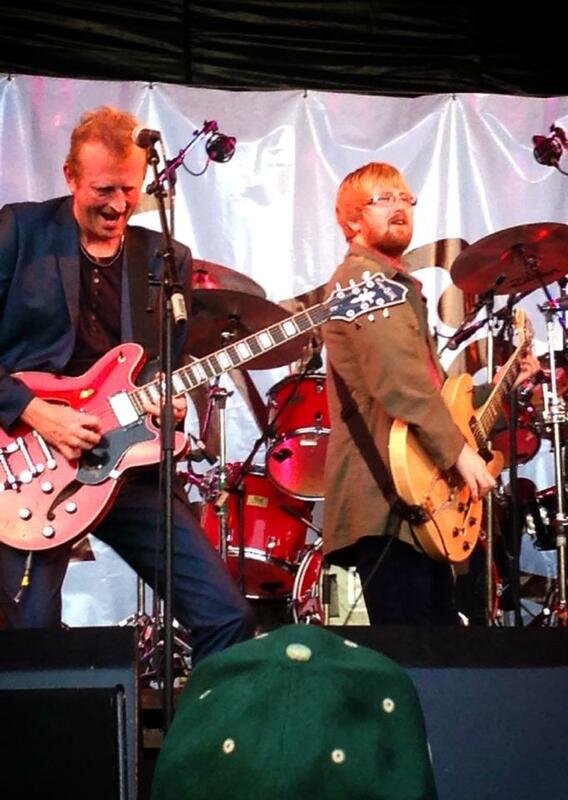 “Simon’s done a lot of session work in the past, with the likes of Denny Laine. When we were working with Mike, we changed the key of the songs to suit his voice. “He also brought his own thing to the table. With Simon it’s very much doing the songs exactly as they were done back in the day, and how it sounded on the record. “It’s going to happen in any occupation where you’ve got one guy doing two things. It’s going to come to a head at some point. “And last year, Mike told us he was going to have to take a year away from Big Country to do his own 30th anniversary albums! Between commitments, Mark has played drums for Bruce Foxton and From the Jam. But I always got the feeling, despite his full commitment, that Big Country remained his top priority. In fact, the drumming on Senses of Summer, the last song on Bruce Foxton’s comeback album, Back in the Room, seems to suggest something of an amalgam of Big Country and The Jam. And then there’s Derek Forbes on bass, replacing founder member Tony Butler. I was aware of that, actually, as my Bude-based nephew, Dexter Wyatt, has enjoyed the benefits of Tony’s tutorial experience at Petroc College. “Ah, brilliant! Well, when Tony left, I’d worked with Derek previously, so he was our first port of call. He was working with his ex-band members from Simple Minds but looking to do something else. While the band’s commercial success dwindled throughout the 80s, they retained a loyal fan-base, paving the way for their later reformation. What can we expect when we come along to The Muni Theatre in Colne (this Friday, October 10) or any of the dates that follow? “The set will be split into two 45-minute halves, just like a game of football, with the Steeltown album followed by songs from the back-catalogue. Personally, I prefer those days, when you’d have a fifth or sixth track that would sign you off before the second side of the record. “And then you turn over – exactly! That’s what we did last night. After five songs I said that. 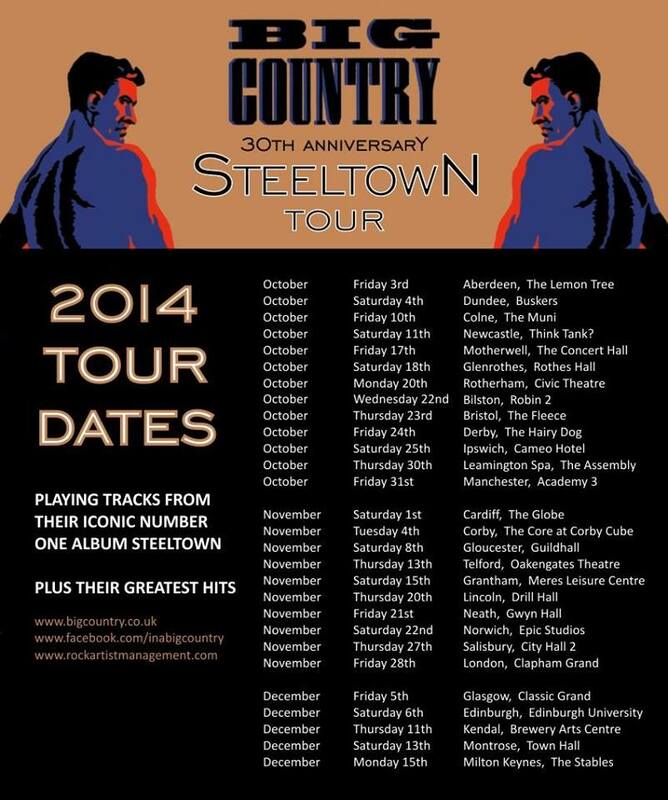 For full details of Big Country’s Steeltown 30th anniversary tour, the newly-released deluxe edition of the album, and all the latest from the band, head here. This is a revised and expanded version of a Malcolm Wyatt feature for the Lancashire Evening Post, first published on October 9th, 2014. For the original online version, head here. 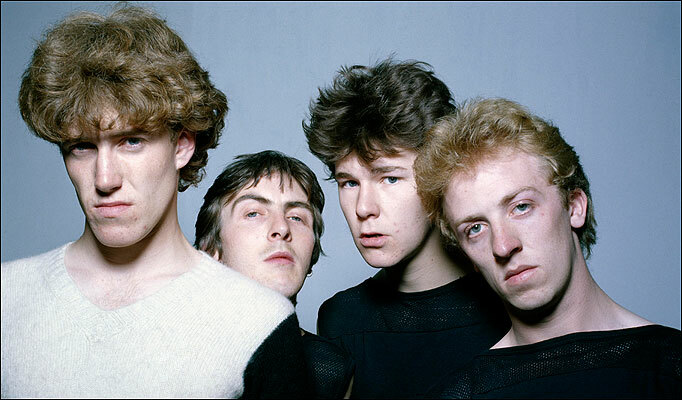 This entry was posted in Music and tagged Big Country, Bruce Watson, Derek Forbes, Dunfermline, Jamie Watson, lancashire, Mark Brzezicki, Mike Peters, Scotland, Simon Hough, Steeltown, Stuart Adamson, The Crossing, The Skids, Tony Butler. Bookmark the permalink.